What is the best manual coffee grinder? Everyone has their opinions. In reality, no coffee grinder is going to be perfect for everyone. We’ve included a variety of the best coffee grinders so that you can make the decision for yourself! We’re sure that you’ll find a grinder to make your perfect cup of coffee on our list. First, here are some things you should know to help inform your decision. Material: What is the coffee grinder made of? 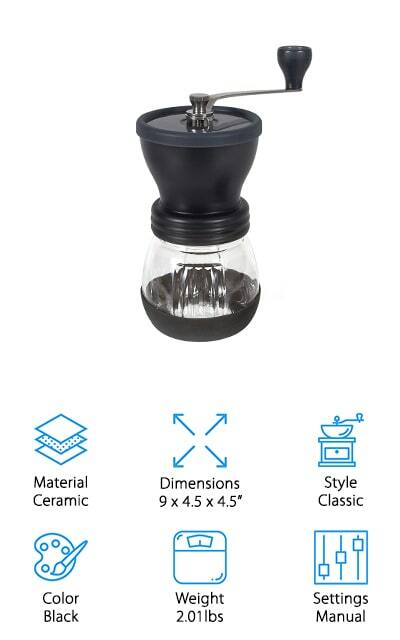 A ceramic grinder with a glass cup for catching the grinds seems to be the most popular, though stainless steel and wood are also options depending on the style. 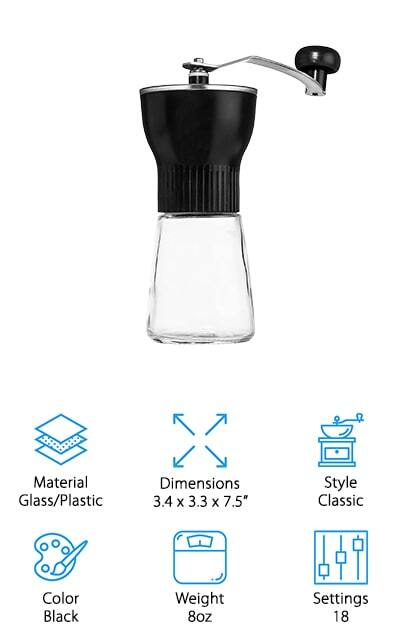 Dimensions: The dimensions will tell you where you can place the grinder on your countertop. Knowing the size of the grinder will also tell you how many beans that you can grind before you empty the cup. Style: There are three primary styles: Classic grinders are simple, just what you’d think. Modern grinders are fancier stainless-steel constructions with no clear cup. 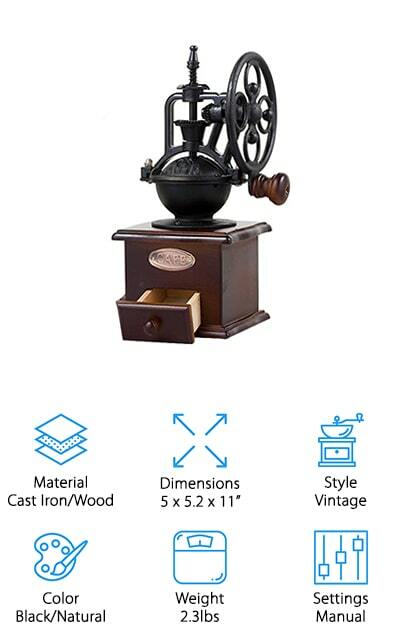 Vintage grinders have an antique look and feel, including wooden drawers for the grounds. Color: What color is the grinder? This depends on the style. Most classic grinders come in black, modern are silver for the stainless steel, and vintage grinders might be a natural wood color with cast iron accents. Weight: How much does the grinder weigh? This will only tell you the weight without any beans in either the cup or grinding compartment. It’s important in case you’re taking it with you on the go. Settings: How many settings are there for customizing your grind? Some have pre-set that you can choose from, while others have a manual dial that you turn for countless different grinding options. It’s up to you! Now that you know what you’re looking for, we can get to the best manual coffee grinder reviews. The choice is yours, and you will need to choose a grinder that best suits your needs as a coffee connoisseur. You’ll no doubt have your favorite settings in mind, and we’re here to help. Our top pick and budget pick are highlights, so get your favorite coffee beans ready and check those out first. 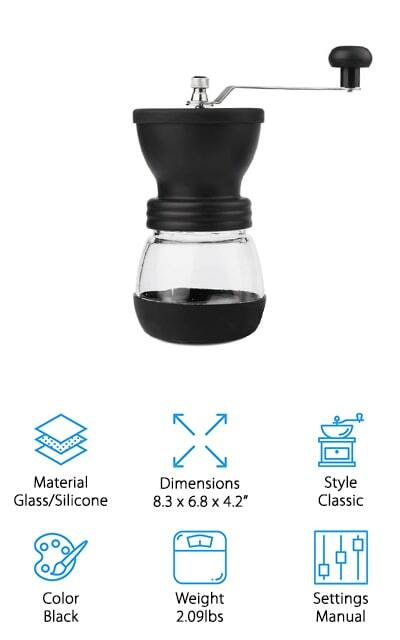 Hario’s Ceramic Coffee Mill is our choice for the best manual coffee grinder on the market. Conical burrs are by far the most popular and precise way to grind your coffee, and you can find them featured in this mill. The rubber base has non-slip feet that keep the grinder in place while you’re preparing your coffee grounds. The classic crank handle is ergonomically designed so that you can make your coffee comfortably, and the handle detaches for travel and compact storage. 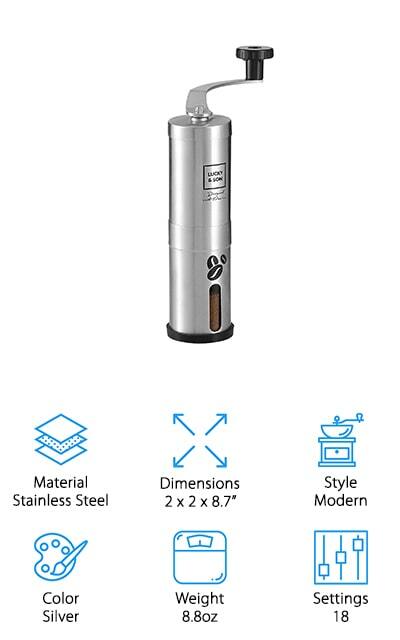 You can take this coffee grinder with you anywhere. Take it with you on your camping trips when you can’t stand to be without your favorite coffee, and use it at home for delicious coffee as well. You’ll get a consistent grind no matter where you’re making your morning coffee because there is a single setting. Your coffee will be perfect each and every time. We love this grinder, and you will too! Our choice for the most affordable coffee grinder is this one by JavaPresse. There is a built-in adjustable grinding system so you can select any of the 18 settings for your grounds. It’s one of the best manual coffee grinders for pour over makers because you can completely adjust this ground level. We’re sure you’re going to find the perfect grind level for your favorite cup of coffee, no matter whether you’re using a traditional drip coffee pot, a french press, or a percolator to brew it. 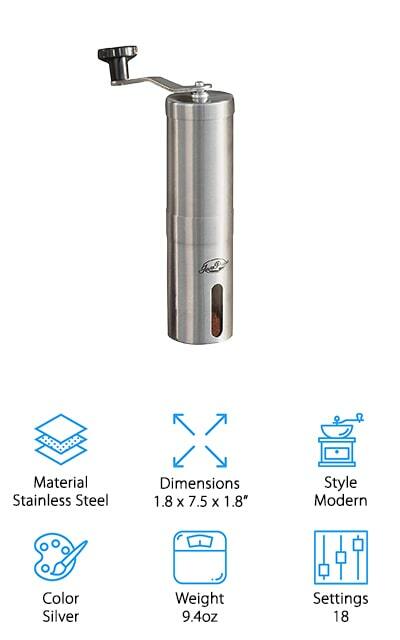 This grinder is a modern stainless steel construction that looks great on your counter or on the go. You can take it camping or hiking, and enjoy a flavorful, fresh pot of coffee anywhere. The ceramic combo burrs will last you a long time, longer than stainless steel blades that come in some other grinders. For at home or on the go, never make standard, tasteless coffee again! Gourmia makes this vintage Artisanal coffee grinder that will look beautiful on your kitchen counters. It’s a larger cabinet than some other grinders and comes with a no-mess catch drawer that you can access conveniently from the front of the machine. The grinding portion of the device is made with beautiful black cast iron to lend to that antique look. You can adjust the cog nut to choose two different settings: coarse or extra fine. Use them both to discover which setting makes your perfect cup of coffee. Use it with a french press or most other brewing systems. In fact, the ceramic burr system and iron grinding mechanism make this one of the best manual coffee grinders for espresso. If there is a gourmet coffee fan in your house, this makes the perfect gift. You can even mix in other spices to get a uniquely flavored coffee because this grinder also works for nuts, herbs, and spices! This manual coffee grinder by KONA is lightweight and works extremely quietly. It’s large enough to use for two coffee drinkers when you’re on the road, camping, or even at the office. The handle detaches so you can take it with you anywhere without breaking it or taking up too much space. The glass jar holds up to 50 grams of beans, so you can make three cups of coffee with a single fill. There are 18 click adjustments on the ceramic burrs, so you can get grinds that are perfect for every type of coffee maker, including Keurigs, espresso machines, and cold brew. Manual grinding is made easy with this machine - it’s easy to grip the base and the handle is comfortable to use. The axles are strip-proof so that your grinder will keep working for many years to come. The conical burrs are high-density and include high wear thresholds as well as corrosion resistance. Simple Kitchen Products makes this simple ceramic grinder. It’s a heavy, classic-style grinder that is going to look perfect on your kitchen counter. It’s a bit larger, so if there are multiple coffee lovers traveling with you, you’ll be able to make enough coffee for everyone. The hand crank is fully adjustable to a wide number of hand crank settings, so you can choose the perfect grind. When you use the dial to change the setting, you are tightening the grindstones and loosening them to determine whether your grounds are coarse or fine. Get the proper flavor and taste - and even the perfect aroma. They feature the best manual coffee grinder burrs: both are precise ceramic constructions that won’t produce heat. Heat can sometimes leech the taste out of your coffee, so that’s a great feature! It’s a great value for a huge grinder that will make plenty of your favorite coffee at home or on the go. 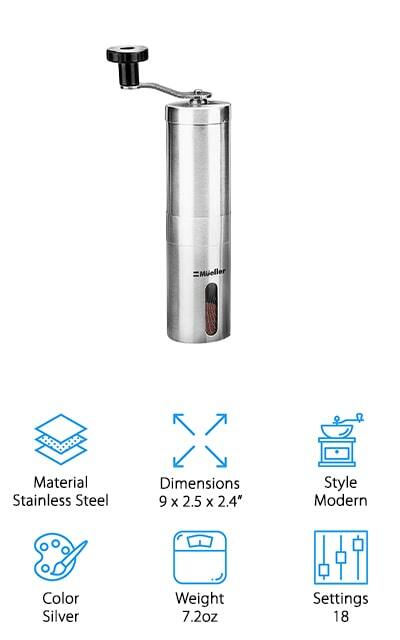 This modern coffee grinder from Mueller is a sleek machine made of quality stainless steel. The grinding burrs are ceramic combo constructions, and you can choose one of 18 different click settings so that you get the right grounds for your coffee maker. From percolators to drip coffee makers, there’s a setting for each and every coffee maker. Lock your favorite setting into place for consistently great coffee. The burrs will last longer than regular stainless steel blades, so you can keep making flavorful brews! It’s extremely portable and lightweight when it’s empty, which makes it great for taking with you on backpacking trips. All of your adventures can now be accompanied by a great cup of coffee. It doesn’t get much better than that! This is a quality grinder that you’re going to love using, whether you’re at home or on the go. You don’t have to limit yourself to mediocre coffee when you have this grinder! Triple Tree’s coffee mill is a little unique on our list. It still has a classic design, but it’s made of glass and soft silicone for convenience and ease of use. The ceramic burrs repel heat, so your grinds will be flavorful and delicious for your coffee makers. You can manually select the size of the grounds by using the nut on the top of the grindstone casing. Lock in your favorite setting for a great cup of coffee every time, no matter where you are. The long, stainless steel handle will allow you to grind beans with less effort, and makes the process more enjoyable overall. The silicon lid is soft and makes it convenient to add your favorite beans; on top of that, you can easily take the machine apart to clean each and every part. If your favorite beans are a little more robust, you can clean the grinder right after making them for no residue or build-up. This modern 18-setting grinder by Lucky & Son is great for taking with you on the road. It’s quiet and lightweight, so you won’t disturb anyone while you’re making perfect grinds. You won’t need batteries or any sort of electricity to get your perfect coffee grounds each and every time. It comes with a silicone funnel and protection ring to make sure that all of your beans end up right where you want them to, without a single spilled bean. Use the click settings to get the right grinds for Keurig cups, Turkish coffee makers, cold brew, or french press machines - plus many, many more. The stainless steel design will last, so you can keep making flavorful, aromatic coffee each and every morning no matter where you are! It’s even small enough to hold right in your hand while you prepare your grounds. Try all of the settings to make sure that you love the coffee you’re making. 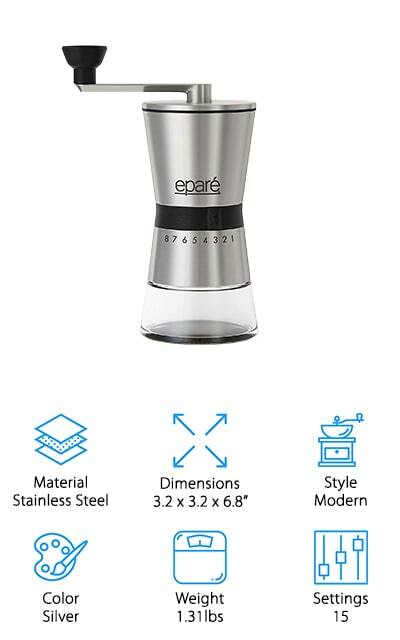 Epare’s stainless steel grinder has a modern design and feel, but it’s unique from the others on our list. There are 15 different settings, each of which is comparable to an electric coffee grinder output. You get complete control over the size of your grounds, which has a massive effect on the way that your coffee smells and tastes. The hopper is easy to load and holds about 60 grams of coffee beans. It’s a simple system that allows you to load without the hassle of reattaching a lid. On the inside, ceramic burrs grind down your beans to the perfect size for whatever coffee maker that you’re using. The grind will always be consistent, and it will never rust or get dull. They guarantee the burrs for life! It’s easy to rinse out and clean as it needs it as well. This grinder will be the perfect addition to your kitchen or the perfect gift for your coffee lover! If you’ve been holding out for the perfect vintage-looking coffee grinder, we’ve finally found it. 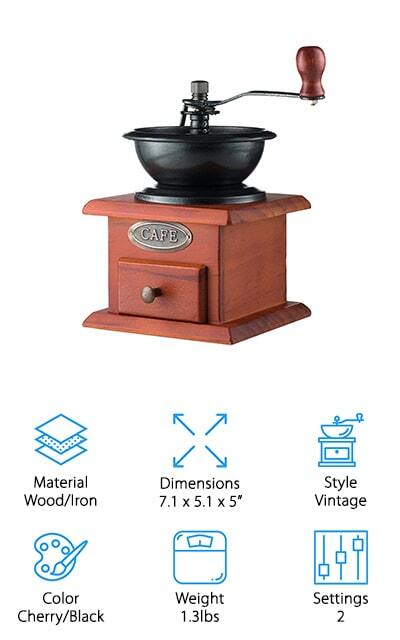 This grinder is made of cast iron and wood - it’s a beautiful construction that still uses modern technology to get you the perfect coffee grounds for your next cup. It will be a beautiful addition to your kitchen countertop. You can use it to grind all of your favorite beans no matter what the strength, and you can also grind your own herbs and spices. Whether you add them to the coffee or not is your decision, but this grinder allows you to play around with it! The wooden bottom has an easy-to-empty drawer. This entire coffee grinder is convenient and simple, with ceramic burrs for a great grind. It even includes a coffee bean grinder brush to clean out whatever is left in the grinder after you’ve made your coffee. It’s fun and easy, and would make the perfect gift!